Although a given hormone may travel throughout the body in the bloodstream, it will affect the activity only of its target cells; that is, cells with receptors for that particular hormone. Once the hormone binds to the receptor, a chain of events is initiated that leads to the target cell’s response. Hormones play a critical role in the regulation of physiological processes because of the target cell responses they regulate. These responses contribute to human reproduction, growth and development of body tissues, metabolism, fluid, and electrolyte balance, sleep, and many other body functions. The major hormones of the human body and their effects are identified in [link]. The hormones of the human body can be divided into two major groups on the basis of their chemical structure. Hormones derived from amino acids include amines, peptides, and proteins. Those derived from lipids include steroids ([link]). These chemical groups affect a hormone’s distribution, the type of receptors it binds to, and other aspects of its function. Hormones derived from the modification of amino acids are referred to as amine hormones. Typically, the original structure of the amino acid is modified such that a –COOH, or carboxyl, group is removed, whereas the , or amine, group remains. Amine hormones are synthesized from the amino acids tryptophan or tyrosine. An example of a hormone derived from tryptophan is melatonin, which is secreted by the pineal gland and helps regulate circadian rhythm. Tyrosine derivatives include the metabolism-regulating thyroid hormones, as well as the catecholamines, such as epinephrine, norepinephrine, and dopamine. Epinephrine and norepinephrine are secreted by the adrenal medulla and play a role in the fight-or-flight response, whereas dopamine is secreted by the hypothalamus and inhibits the release of certain anterior pituitary hormones. Whereas the amine hormones are derived from a single amino acid, peptide and protein hormones consist of multiple amino acids that link to form an amino acid chain. Peptide hormones consist of short chains of amino acids, whereas protein hormones are longer polypeptides. Both types are synthesized like other body proteins: DNA is transcribed into mRNA, which is translated into an amino acid chain. Examples of peptide hormones include antidiuretic hormone (ADH), a pituitary hormone important in fluid balance, and atrial-natriuretic peptide, which is produced by the heart and helps to decrease blood pressure. Some examples of protein hormones include growth hormone, which is produced by the pituitary gland, and follicle-stimulating hormone (FSH), which has an attached carbohydrate group and is thus classified as a glycoprotein. FSH helps stimulate the maturation of eggs in the ovaries and sperm in the testes. The primary hormones derived from lipids are steroids. Steroid hormones are derived from the lipid cholesterol. For example, the reproductive hormones testosterone and the estrogens—which are produced by the gonads (testes and ovaries)—are steroid hormones. The adrenal glands produce the steroid hormone aldosterone, which is involved in osmoregulation, and cortisol, which plays a role in metabolism. Like cholesterol, steroid hormones are not soluble in water (they are hydrophobic). Because blood is water-based, lipid-derived hormones must travel to their target cell bound to a transport protein. This more complex structure extends the half-life of steroid hormones much longer than that of hormones derived from amino acids. A hormone’s half-life is the time required for half the concentration of the hormone to be degraded. For example, the lipid-derived hormone cortisol has a half-life of approximately 60 to 90 minutes. In contrast, the amino acid–derived hormone epinephrine has a half-life of approximately one minute. The message a hormone sends is received by a hormone receptor, a protein located either inside the cell or within the cell membrane. The receptor will process the message by initiating other signaling events or cellular mechanisms that result in the target cell’s response. Hormone receptors recognize molecules with specific shapes and side groups, and respond only to those hormones that are recognized. The same type of receptor may be located on cells in different body tissues, and trigger somewhat different responses. Thus, the response triggered by a hormone depends not only on the hormone, but also on the target cell. Once the target cell receives the hormone signal, it can respond in a variety of ways. The response may include the stimulation of protein synthesis, activation or deactivation of enzymes, alteration in the permeability of the cell membrane, altered rates of mitosis and cell growth, and stimulation of the secretion of products. Moreover, a single hormone may be capable of inducing different responses in a given cell. Intracellular hormone receptors are located inside the cell. Hormones that bind to this type of receptor must be able to cross the cell membrane. Steroid hormones are derived from cholesterol and therefore can readily diffuse through the lipid bilayer of the cell membrane to reach the intracellular receptor ([link]). Thyroid hormones, which contain benzene rings studded with iodine, are also lipid-soluble and can enter the cell. The location of steroid and thyroid hormone binding differs slightly: a steroid hormone may bind to its receptor within the cytosol or within the nucleus. In either case, this binding generates a hormone-receptor complex that moves toward the chromatin in the cell nucleus and binds to a particular segment of the cell’s DNA. In contrast, thyroid hormones bind to receptors already bound to DNA. For both steroid and thyroid hormones, binding of the hormone-receptor complex with DNA triggers transcription of a target gene to mRNA, which moves to the cytosol and directs protein synthesis by ribosomes. A steroid hormone directly initiates the production of proteins within a target cell. Steroid hormones easily diffuse through the cell membrane. The hormone binds to its receptor in the cytosol, forming a receptor–hormone complex. 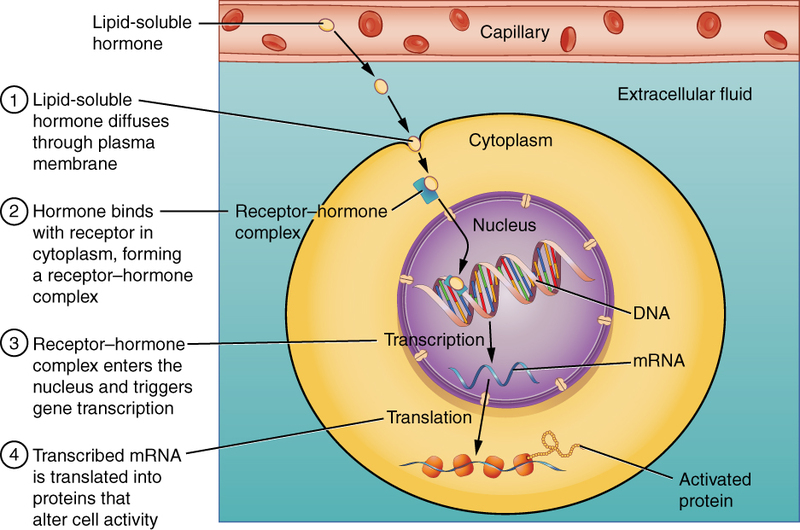 The receptor–hormone complex then enters the nucleus and binds to the target gene on the DNA. Transcription of the gene creates a messenger RNA that is translated into the desired protein within the cytoplasm. Hydrophilic, or water-soluble, hormones are unable to diffuse through the lipid bilayer of the cell membrane and must therefore pass on their message to a receptor located at the surface of the cell. Except for thyroid hormones, which are lipid-soluble, all amino acid–derived hormones bind to cell membrane receptors that are located, at least in part, on the extracellular surface of the cell membrane. Therefore, they do not directly affect the transcription of target genes, but instead initiate a signaling cascade that is carried out by a molecule called a second messenger. In this case, the hormone is called a first messenger. The second messenger used by most hormones is cyclic adenosine monophosphate (cAMP). In the cAMP second messenger system, a water-soluble hormone binds to its receptor in the cell membrane (Step 1 in [link]). This receptor is associated with an intracellular component called a G protein, and binding of the hormone activates the G-protein component (Step 2). The activated G protein in turn activates an enzyme called adenylyl cyclase, also known as adenylate cyclase (Step 3), which converts adenosine triphosphate (ATP) to cAMP (Step 4). 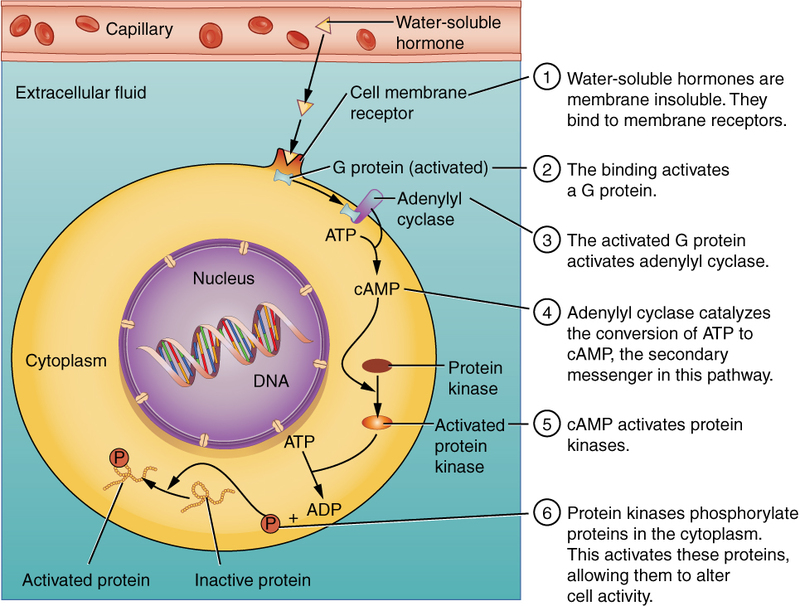 As the second messenger, cAMP activates a type of enzyme called a protein kinase that is present in the cytosol (Step 5). Activated protein kinases initiate a phosphorylation cascade, in which multiple protein kinases phosphorylate (add a phosphate group to) numerous and various cellular proteins, including other enzymes (Step 6). Water-soluble hormones cannot diffuse through the cell membrane. These hormones must bind to a surface cell-membrane receptor. The receptor then initiates a cell-signaling pathway within the cell involving G proteins, adenylyl cyclase, the secondary messenger cyclic AMP (cAMP), and protein kinases. In the final step, these protein kinases phosphorylate proteins in the cytoplasm. This activates proteins in the cell that carry out the changes specified by the hormone. The phosphorylation of cellular proteins can trigger a wide variety of effects, from nutrient metabolism to the synthesis of different hormones and other products. The effects vary according to the type of target cell, the G proteins and kinases involved, and the phosphorylation of proteins. Examples of hormones that use cAMP as a second messenger include calcitonin, which is important for bone construction and regulating blood calcium levels; glucagon, which plays a role in blood glucose levels; and thyroid-stimulating hormone, which causes the release of T3 and T4 from the thyroid gland. Overall, the phosphorylation cascade significantly increases the efficiency, speed, and specificity of the hormonal response, as thousands of signaling events can be initiated simultaneously in response to a very low concentration of hormone in the bloodstream. However, the duration of the hormone signal is short, as cAMP is quickly deactivated by the enzyme phosphodiesterase (PDE), which is located in the cytosol. The action of PDE helps to ensure that a target cell’s response ceases quickly unless new hormones arrive at the cell membrane. Importantly, there are also G proteins that decrease the levels of cAMP in the cell in response to hormone binding. For example, when growth hormone–inhibiting hormone (GHIH), also known as somatostatin, binds to its receptors in the pituitary gland, the level of cAMP decreases, thereby inhibiting the secretion of human growth hormone. Not all water-soluble hormones initiate the cAMP second messenger system. One common alternative system uses calcium ions as a second messenger. In this system, G proteins activate the enzyme phospholipase C (PLC), which functions similarly to adenylyl cyclase. Once activated, PLC cleaves a membrane-bound phospholipid into two molecules: diacylglycerol (DAG) and inositol triphosphate (IP3). Like cAMP, DAG activates protein kinases that initiate a phosphorylation cascade. At the same time, IP3 causes calcium ions to be released from storage sites within the cytosol, such as from within the smooth endoplasmic reticulum. The calcium ions then act as second messengers in two ways: they can influence enzymatic and other cellular activities directly, or they can bind to calcium-binding proteins, the most common of which is calmodulin. Upon binding calcium, calmodulin is able to modulate protein kinase within the cell. Examples of hormones that use calcium ions as a second messenger system include angiotensin II, which helps regulate blood pressure through vasoconstriction, and growth hormone–releasing hormone (GHRH), which causes the pituitary gland to release growth hormones. You will recall that target cells must have receptors specific to a given hormone if that hormone is to trigger a response. But several other factors influence the target cell response. For example, the presence of a significant level of a hormone circulating in the bloodstream can cause its target cells to decrease their number of receptors for that hormone. This process is called downregulation, and it allows cells to become less reactive to the excessive hormone levels. When the level of a hormone is chronically reduced, target cells engage in upregulation to increase their number of receptors. This process allows cells to be more sensitive to the hormone that is present. Cells can also alter the sensitivity of the receptors themselves to various hormones. The permissive effect, in which the presence of one hormone enables another hormone to act. For example, thyroid hormones have complex permissive relationships with certain reproductive hormones. A dietary deficiency of iodine, a component of thyroid hormones, can therefore affect reproductive system development and functioning. The synergistic effect, in which two hormones with similar effects produce an amplified response. In some cases, two hormones are required for an adequate response. For example, two different reproductive hormones—FSH from the pituitary gland and estrogens from the ovaries—are required for the maturation of female ova (egg cells). The antagonistic effect, in which two hormones have opposing effects. A familiar example is the effect of two pancreatic hormones, insulin and glucagon. Insulin increases the liver’s storage of glucose as glycogen, decreasing blood glucose, whereas glucagon stimulates the breakdown of glycogen stores, increasing blood glucose. To prevent abnormal hormone levels and a potential disease state, hormone levels must be tightly controlled. The body maintains this control by balancing hormone production and degradation. Feedback loops govern the initiation and maintenance of most hormone secretion in response to various stimuli. The contribution of feedback loops to homeostasis will only be briefly reviewed here. Positive feedback loops are characterized by the release of additional hormone in response to an original hormone release. The release of oxytocin during childbirth is a positive feedback loop. The initial release of oxytocin begins to signal the uterine muscles to contract, which pushes the fetus toward the cervix, causing it to stretch. This, in turn, signals the pituitary gland to release more oxytocin, causing labor contractions to intensify. The release of oxytocin decreases after the birth of the child. The more common method of hormone regulation is the negative feedback loop. Negative feedback is characterized by the inhibition of further secretion of a hormone in response to adequate levels of that hormone. This allows blood levels of the hormone to be regulated within a narrow range. An example of a negative feedback loop is the release of glucocorticoid hormones from the adrenal glands, as directed by the hypothalamus and pituitary gland. 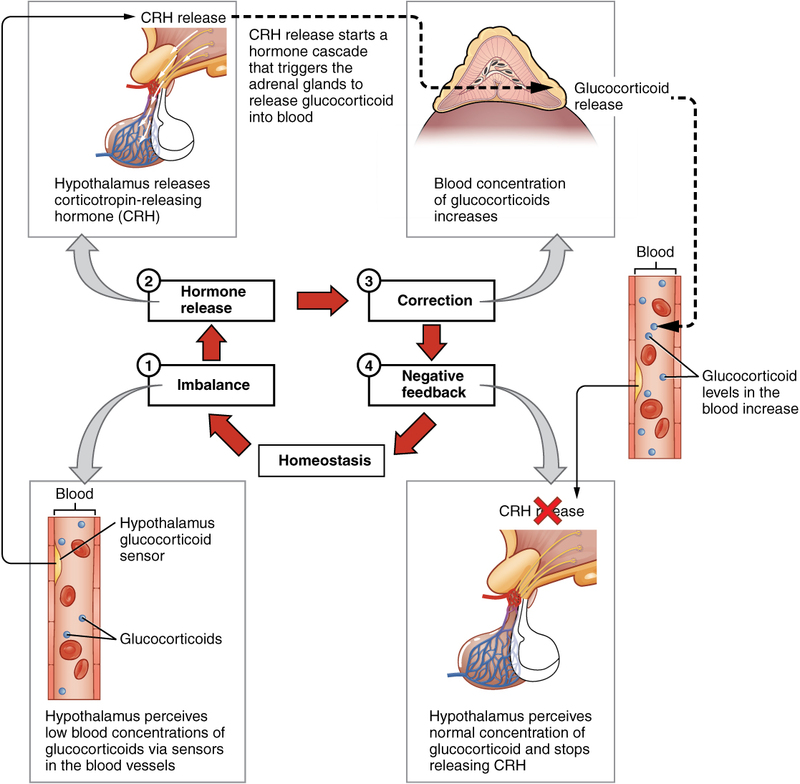 As glucocorticoid concentrations in the blood rise, the hypothalamus and pituitary gland reduce their signaling to the adrenal glands to prevent additional glucocorticoid secretion ([link]). The release of adrenal glucocorticoids is stimulated by the release of hormones from the hypothalamus and pituitary gland. This signaling is inhibited when glucocorticoid levels become elevated by causing negative signals to the pituitary gland and hypothalamus. Reflexes triggered by both chemical and neural stimuli control endocrine activity. These reflexes may be simple, involving only one hormone response, or they may be more complex and involve many hormones, as is the case with the hypothalamic control of various anterior pituitary–controlled hormones. Humoral stimuli are changes in blood levels of non-hormone chemicals, such as nutrients or ions, which cause the release or inhibition of a hormone to, in turn, maintain homeostasis. For example, osmoreceptors in the hypothalamus detect changes in blood osmolarity (the concentration of solutes in the blood plasma). If blood osmolarity is too high, meaning that the blood is not dilute enough, osmoreceptors signal the hypothalamus to release ADH. The hormone causes the kidneys to reabsorb more water and reduce the volume of urine produced. This reabsorption causes a reduction of the osmolarity of the blood, diluting the blood to the appropriate level. The regulation of blood glucose is another example. High blood glucose levels cause the release of insulin from the pancreas, which increases glucose uptake by cells and liver storage of glucose as glycogen. An endocrine gland may also secrete a hormone in response to the presence of another hormone produced by a different endocrine gland. Such hormonal stimuli often involve the hypothalamus, which produces releasing and inhibiting hormones that control the secretion of a variety of pituitary hormones. In addition to these chemical signals, hormones can also be released in response to neural stimuli. A common example of neural stimuli is the activation of the fight-or-flight response by the sympathetic nervous system. When an individual perceives danger, sympathetic neurons signal the adrenal glands to secrete norepinephrine and epinephrine. The two hormones dilate blood vessels, increase the heart and respiratory rate, and suppress the digestive and immune systems. These responses boost the body’s transport of oxygen to the brain and muscles, thereby improving the body’s ability to fight or flee. You may have heard news reports about the effects of a chemical called bisphenol A (BPA) in various types of food packaging. BPA is used in the manufacturing of hard plastics and epoxy resins. Common food-related items that may contain BPA include the lining of aluminum cans, plastic food-storage containers, drinking cups, as well as baby bottles and “sippy” cups. Other uses of BPA include medical equipment, dental fillings, and the lining of water pipes. Research suggests that BPA is an endocrine disruptor, meaning that it negatively interferes with the endocrine system, particularly during the prenatal and postnatal development period. In particular, BPA mimics the hormonal effects of estrogens and has the opposite effect—that of androgens. The U.S. Food and Drug Administration (FDA) notes in their statement about BPA safety that although traditional toxicology studies have supported the safety of low levels of exposure to BPA, recent studies using novel approaches to test for subtle effects have led to some concern about the potential effects of BPA on the brain, behavior, and prostate gland in fetuses, infants, and young children. The FDA is currently facilitating decreased use of BPA in food-related materials. Many US companies have voluntarily removed BPA from baby bottles, “sippy” cups, and the linings of infant formula cans, and most plastic reusable water bottles sold today boast that they are “BPA free.” In contrast, both Canada and the European Union have completely banned the use of BPA in baby products. The potential harmful effects of BPA have been studied in both animal models and humans and include a large variety of health effects, such as developmental delay and disease. For example, prenatal exposure to BPA during the first trimester of human pregnancy may be associated with wheezing and aggressive behavior during childhood. Adults exposed to high levels of BPA may experience altered thyroid signaling and male sexual dysfunction. BPA exposure during the prenatal or postnatal period of development in animal models has been observed to cause neurological delays, changes in brain structure and function, sexual dysfunction, asthma, and increased risk for multiple cancers. In vitro studies have also shown that BPA exposure causes molecular changes that initiate the development of cancers of the breast, prostate, and brain. Although these studies have implicated BPA in numerous ill health effects, some experts caution that some of these studies may be flawed and that more research needs to be done. In the meantime, the FDA recommends that consumers take precautions to limit their exposure to BPA. In addition to purchasing foods in packaging free of BPA, consumers should avoid carrying or storing foods or liquids in bottles with the recycling code 3 or 7. Foods and liquids should not be microwave-heated in any form of plastic: use paper, glass, or ceramics instead. Hormones are derived from amino acids or lipids. Amine hormones originate from the amino acids tryptophan or tyrosine. Larger amino acid hormones include peptides and protein hormones. Steroid hormones are derived from cholesterol. Steroid hormones and thyroid hormone are lipid soluble. All other amino acid–derived hormones are water soluble. Hydrophobic hormones are able to diffuse through the membrane and interact with an intracellular receptor. In contrast, hydrophilic hormones must interact with cell membrane receptors. These are typically associated with a G protein, which becomes activated when the hormone binds the receptor. This initiates a signaling cascade that involves a second messenger, such as cyclic adenosine monophosphate (cAMP). Second messenger systems greatly amplify the hormone signal, creating a broader, more efficient, and faster response. Hormones are released upon stimulation that is of either chemical or neural origin. Regulation of hormone release is primarily achieved through negative feedback. Various stimuli may cause the release of hormones, but there are three major types. Humoral stimuli are changes in ion or nutrient levels in the blood. Hormonal stimuli are changes in hormone levels that initiate or inhibit the secretion of another hormone. Finally, a neural stimulus occurs when a nerve impulse prompts the secretion or inhibition of a hormone. A newly developed pesticide has been observed to bind to an intracellular hormone receptor. If ingested, residue from this pesticide could disrupt levels of ________. A small molecule binds to a G protein, preventing its activation. What direct effect will this have on signaling that involves cAMP? A student is in a car accident, and although not hurt, immediately experiences pupil dilation, increased heart rate, and rapid breathing. What type of endocrine system stimulus did the student receive? Compare and contrast the signaling events involved with the second messengers cAMP and IP3. In both cAMP and IP3–calcium signaling, a hormone binds to a cell membrane hormone receptor that is coupled to a G protein. The G protein becomes activated when the hormone binds. In the case of cAMP signaling, the activated G protein activates adenylyl cyclase, which causes ATP to be converted to cAMP. This second messenger can then initiate other signaling events, such as a phosphorylation cascade. In the case of IP3–calcium signaling, the activated G protein activates phospholipase C, which cleaves a membrane phospholipid compound into DAG and IP3. IP3 causes the release of calcium, another second messenger, from intracellular stores. This causes further signaling events. Describe the mechanism of hormone response resulting from the binding of a hormone with an intracellular receptor. An intracellular hormone receptor is located within the cell. A hydrophobic hormone diffuses through the cell membrane and binds to the intracellular hormone receptor, which may be in the cytosol or in the cell nucleus. This hormone–receptor complex binds to a segment of DNA. This initiates the transcription of a target gene, the end result of which is protein assembly and the hormonal response. 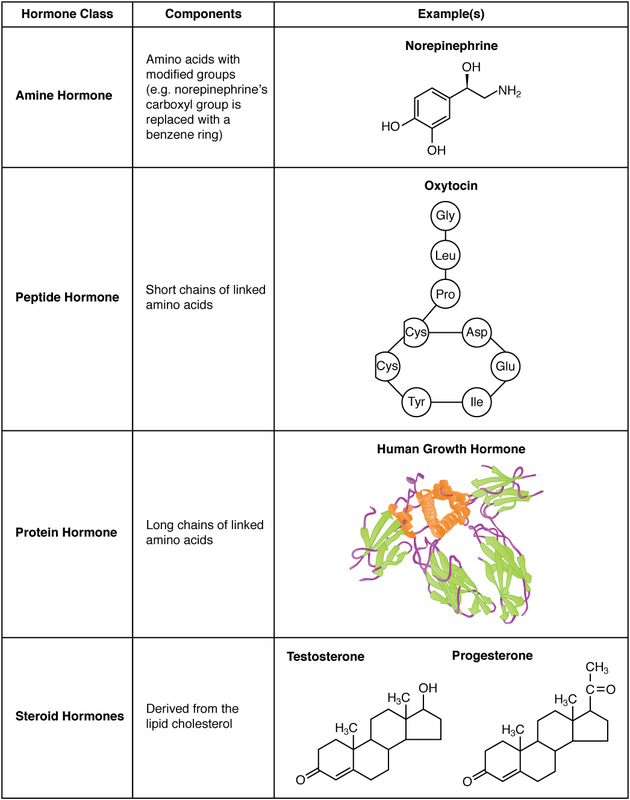 Hormones by OpenStaxCollege is licensed under a Creative Commons Attribution 4.0 International License, except where otherwise noted.